It’s the latest organizing buzz phrase, based on the book The Gentle Art of Swedish Death Cleaning: How to Free Yourself and Your Family from a Lifetime of Clutter, by Margareta Magnusson. The book is about decluttering your home and life now, so your loved ones won’t have to do it for you after you die. Which is precisely what I’ve been talking and writing about for the past few years, just not in so many words! Declutter now so your loved ones won’t have to after you die. I don’t tend to use euphemisms for death – passed away, departed, etc. — but I did stop short of adding ‘death’ to my business name, which was ‘Organized for Life’. Instead of ‘Organized for Life and Death’, I went with ‘Organized for Life…and beyond’. I thought that ‘death’ might be off-putting to potential clients, but it’s apparently not a problem with the Swedes! The book is short, and more lighthearted than you’d expect. Charming, even. It goes a long way towards normalizing the concept of talking about death and preparing for it well in advance. Are you planning to leave everything to your loved ones? They certainly did In They Left Us Everything: A Memoir, by Canadian author Plum Johnson. My Canadian website consultant extraordinaire, Janet Barclay, recommended this book to me. It was good – funny and touching — and I recommend it, especially to my professional organizing colleagues. The author recounts her experience of dealing with her parent’s entire household of possessions after they died. The task turned out to be much harder and more rewarding than she ever imagined. Leaving them everything is not the best plan. The author’s message, in the end, was about how much better she got to know her parents throughout the process of dealing with their stuff. And I can see how that might be true in some cases. If this is what happens in your family — because they left you everything and you really had no choice — great. However, I disagree that it’s a good plan. Take my Mom’s Boxes, for example. I was lucky that my aunt (who lived with my mom at the time in another state) took care of most of my mom’s furniture, books, clothes, and such. But I was still left with 33 boxes of paper: scrapbooks, photo albums, journals, letters, etc. Are they trash or treasure? I’m still sorting it all out. Am I getting to know her better in the process? Not really. There are a few genealogical gold nuggets and puzzle pieces in there, to be sure, but I guess I was fortunate to already knew my mom pretty well. Are you a senior, or helping a senior downsize? If so, then you should read Don’t Toss My Memories in the Trash: A Step-by-Step Guide to Helping Seniors Downsize, Organize, and Move, by Vickie Dellaquila. This book will guide you through every step of the process, including deciding to move, sorting and organizing belongings, creating a plan for moving, and getting settled in a new home. Forced downsizing is kind of like forced death cleaning. You literally cannot fit a whole lifetime’s worth of stuff from a large house into a tiny apartment. Seniors can end up feel resentful, and helpers, related or not, can feel frustrated in the process. It’s not just about the stuff, it’s about the memories and emotions associated with the situation and the stuff. The advice in this book can help ensure a smooth transition. Do you want to live with less? But you don’t have to be a senior to downsize. And you don’t have to be anywhere near death to start death cleaning. Why not start now? Think of it like writing a will. What do you want to happen to your stuff? Will your loved ones be able to tell which things were important to you, and which things are meaningless? Have you made your wishes known to others? What if you aren’t old or sick at all, but you get hit by a bus tomorrow? Or, maybe you just want a life that is simpler and clutter-free? 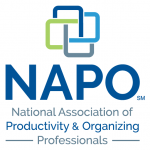 Of course, if you get tired of reading, and you’d like some hands-on de-cluttering and decision-making help, or virtual guidance, don’t hesitate to call me, or a friend, or find a professional organizer near you at www.napo.net! Are you downsizing, or helping a loved one to downsize? Have you started death cleaning? Hazel, I’m so pleased that you enjoyed They Left Us Everything! I was reflecting on the enormity of Johnson’s task as we sifted through my father’s apartment recently. That was overwhelming enough, and he had already downsized more than once – but it had its rewards as well. My siblings and I plan to get together in the fall to go through several boxes of photographs and other memorabilia. I love how you’ve paired this group of books together – living with less, letting go, downsizing when you are and aren’t ready. As I just finished a clearing out and selling my parents’ home of close to 60 years, I think I’m going to have to read Plum Johnson’s memoir. 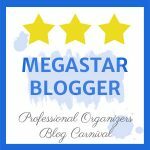 There are so many of us organizers going through that! I hope your experience wasn’t too painful. I read ‘They Left Us Everything’ and would agree with you Hazel that everything is not what I want to leave behind or deal with when my loved ones go. I found it a great read because I am local to where the home talked about in the book was so I found the descriptions fascinating. I loved how Plum Johnson got so much out of the process and I can see that for some it could be therapeutic but the process is certainly not for everyone. The time investment is immense! I would rather spend quality time with people not stuff. Did Janet recommend it to you? (Or vice-versa?) And are you the one who said once that you were so close you could walk by the house? Speaking of unintentional themes, I’ve read three novels this year that featured miners and/or mining – all different locations and eras. Funny. If you didn’t know better you might think my book club was purposely focused on WWII novels. I complain of it but occasionally pick one myself. There are so many stories that came out of that war!